Are your feet getting you down? Are you looking for a new approach to stubborn stains? Do you want half the calories but twice the flavour? 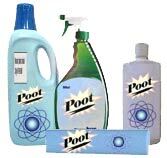 Laboratory tests have revealed that New Poot is over three times as effective as other leading brands, is gentler on the skin and won't leave a hole in your pocket - not unless you want it to. "I've been using Poot for over three months and already I've noticed the difference. My teeth are whiter, my carpets smell better, my cat is going to live 20% longer and, boy!, you should see what I'm packing in my underpants these days. Oh wow, I'm impressed, and no mistake, cor blimey. I certainly wouldn't go back to using my old brand. What! No bleedin' chance, matey." So switch to Poot today, and see if you can spot the difference! 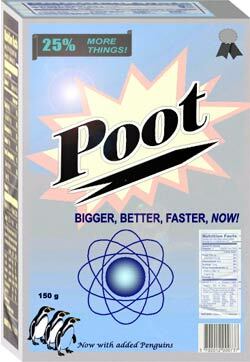 For busy mums in a hurry there's now New Poot Lite. to expect from regular Poot, but in a smaller box. Also available: Poot Soluble, Poot Nightime, Decaffeinated Poot, Poot Extra, Poot with Lemons, Poot Spray, Poot Stick, Poot for Girls. From the people who brought you Plop.